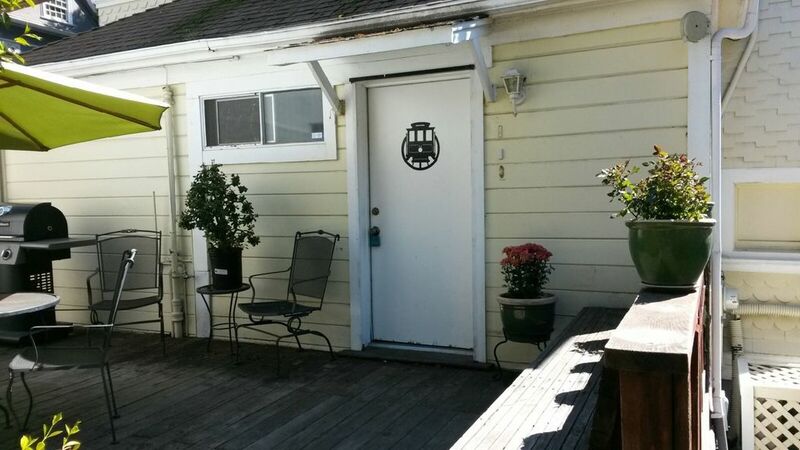 If you are visiting locally, San Francisco, Napa valley, Six Flags amusement park or any of the wonderful explorations available in the bay area this unique space provides an affordable and central base. Fast WiFi is running on trueSTREAM supported by dslEstreme's fiber network. And we just completed our periodic deep cleaning (carpets, furniture, walls & railings). The term "Rosie the Riveter" was actually first used in 1942 in reference to the WWII female workforce supporting the war effort. This old Shipyard Worker's Apartment served Mare Island workers for WWI and WWII. Sitting on the 3rd floor of an 1890 Victorian the unit boasts updated amenities in a "shabby chic" style with a color scheme reminiscent of its unique past. Sleeping accommodates 6 adults with 1 bedrooms (with 2 full double beds) plus a sofa sleeper in the living space. The bath has a shower over tub and kitchen is fully equip, including a portable dishwasher. There is space to eat in the dinette or bar counter in the kitchen. A toddler bed can be set up upon request and there is one high chair available. You have exclusive use of the entire unit. Outside there is a small deck common space with table/chairs in the yard and a BBQ. All essentials are included. Unit complies with smoke detector, carbon monoxide detector, first aid kit and fire extinguisher. The unit is rustic and that is what lends to its charm. We recognize the uniqueness appeals to different people but know that we work hard to maintain the unit by routinely cleaning the carpets, curtains and furniture. A clean and healthy vacation rental is your right and our obligation! We pride ourselves in providing sleeping accommodations that are protected with mattress AND boxspring total encasements ("Bug Blocker" brand) for your complete peace of mind. The property is also thoroughly cleaned prior to the arrival of every guest and our goal is to provide an impeccably clean and comfortable space for your visit. This routine includes laundering all the linens (whites are bleached with traditional bleach & colors bleached with color safe alternative bleach), polish all table tops, vacuum all carpeting, wash (mop with sanitizer) all the floors, sanitize all the countertops with a bleach additive cleaner, and clean the bathroom entirely including bleaching the toilet, sink, tub & floor. The cleaning fee imposed at booking covers linen service and sanitary cleaning but does not dispense with the customary expectation that before departure you remove trash, clean up after yourselves (spills), wash/put away dishes/dishware and leave the unit tidy (broom swept condition). Extra cleaning is charged at $30 per hour. Booking this space is an agreement that you are responsible for damage to the unit and furnishings (calculated at market rate replacement cost). Insurance is made available at booking if you desire but you accept the risk of liability should you decline it. Please also understand that this unit is made available as a vacation rental unit, not an event space. No parties are to be held on site without a separate written agreement detailing the purpose and cost. Booking constitutes agreement that ignoring this provision will result in tripling the rental rate, plus a $700 surcharge plus supplemental cleaning expense at $30 per hour. Any holdover of the unit (remaining in residence beyond your agreed final date & time) also constitutes agreement under your booking to payment of damages (that may be incurred for incoming guests not able to take up residence) and the tripling of the rental rate plus a $700 surcharge together with supplemental cleaning expense at $30 per hour. The bus terminal is 3 blocks away which allows public transit access throughout Vallejo, neighboring communities and BART (the subway). The BayLink Ferry to San Francisco is a short walk to the Vallejo waterfront. Nearby waterfront with restaurants and ferry to San Francisco. We enjoyed our stay at this property very much. It was a quaint and comfortable apartment, exactly as described in the description. Karl left many goodies for our stay. The washer and dryer were wonderful for our week stay. The location of this historical house was located within walking distance for many neat things to see. Antique stores, art galleries and Saturday farmer markets. Would highly recommend. Thank you Karl. I came to Vallejo tonvidit with my brothers. Check in was easy. We had clear directions. The place was centrally located for easy access. The unit was quaint and tiidy and had everything we needed. The owner was very responsive to all of our concert. Since this was s guys trip our needs were simple. We were very happy overslll. We really enjoyed our stay at Rosie the Riveter apartment! The location was perfect for us. We were close to everything that we wanted to do. Ken was super about everything and was very quick to answer any questions that we might have had. I would highly recommend using this unit. Well kept historical home with great amenities and friendly, responsive host. We chose this home for my family to stay in while attending a wedding on the south side of Napa. The description of the space was accurate and our host sent a ton of advice and options to enjoy the surrounding areas prior to arrival. The four of us were very comfortable with plenty of room to spread out, which included the outdoor patio space. We enjoyed some nice treats left by our host and were surprised to find a pretty robust farmers market happening two blocks away on Saturday morning. It was easy to get in and out and the parking was very easy to work with even in our SUV. I would definitely recommend this space to anyone looking for a quiet retreat near all of the great places to visit in Northern California. My family of 4 was very comfortable and karl did a great job not only making sure the place was ready in advance but he went above and beyond to make sure we knew any quirks about the pace, the history of the area, and great tourist spots! We will definitely stay there again! Short driving distance to 6 Flags. 25 minute drive to San Francisco. 20 minute drive to Napa.